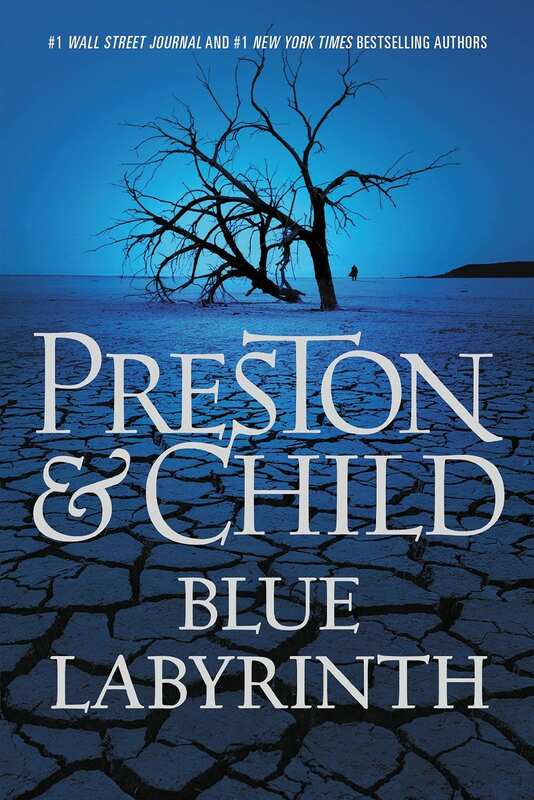 Fresh from the successful fight against Amazon, Douglas Preston took to the review section of the Kindle Store today to complain about the delayed release of Blue Labyrinth. 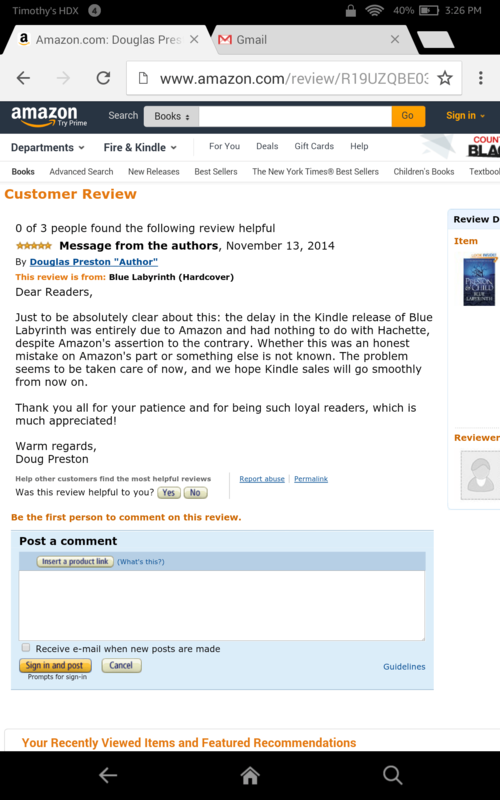 Just to be absolutely clear about this: the delay in the Kindle release of Blue Labyrinth was entirely due to Amazon and had nothing to do with Hachette, despite Amazon's assertion to the contrary. Whether this was an honest mistake on Amazon's part or something else is not known. The problem seems to be taken care of now, and we hope Kindle sales will go smoothly from now on. Thank you all for your patience and for being such loyal readers, which is much appreciated! Preston was responding to the double handful of one star reviews left by frustrated fans. That ebook was due to be released on 11 November, but for some unknown reason it was delayed until about 2 pm eastern on that day. Ten readers took to the review section to voice their displeasure first thing Tuesday morning (out of approximately 150 reviews as of 13 November), and Preston responded today with a 5 star review which blamed Amazon. As you may recall, Doug Preston is the leader of Authors United, the nonpartisan authors group which formed to peacefully bring about a deal between Amazon and Hachette. As a long time observer of publishing, I can assure you that all of Preston's statements have shared a similar balanced and nonpartisan viewpoint. Nook App to Come Pre-Installed on Windows 8 Next Year? You’re most welcome. This “review” is so quintessentially Preston, I am glad it could be preserved for the mockery it richly deserves. I dare you to prove that I mocked it at all. How many inches did your nose grow from writing the last two paragraphs? Now if his book doesn’t do well it will be all Amazon’s fault, right? I thought you were trying to cut down on the snark, Nate. I definitely would take any statement from Preston blaming Amazon with a grain to salt, though. He probably blames the small earthquake in Kansas yesterday on Amazon having shipping centers in the state. Why would you cut down the snark? Don’t we get to vote on it? I did cut down on the snark. The only way you can tell there is snark in this post is the completely neutral tone. That is anti-snark, which I never said I would reduce. If you mix snark and anti-snark, you can power a warp drive. Oh, boo hoo. Talk about first world problems. I went straight to the page to check out the preview of this book, this precious gem of literature that had been so cruelly long withheld from the eager public. “It was a dark and stormy night,” it begins, or with words to that effect. Who could resist it? I’m sure there are circumstances under which I might feel impelled to read it, but if god is fair I’ll never encounter them. A gun to your back? So, what you’re saying is that Amazon did the world a favour by delaying the book! I’ve been following this book awaiting its release. This title was available at Google first for $6.49 then the price increased to $9.09 . Amazon initially had it priced at $12.99 but has since matched Google’s $9.09 price. Who’s Douglas Preston? Never mind, I have some indie ebooks to read that I bought for $4.99 or less. Are you trying to tell me that Amazon released the kindle version on the day they said they would? Very true, there is no limit to the wickedness of the arch-villain Beelzebezos! Preston’s fans were forced to wait an additional 10.5 hours to view this eagerly awaited tome. That’s why Preston deigned to visit the oppressor’s foul website, to offer warm greetings to his doting readers, and to offer comfort in their hour of need. That he offered his comfort through a 5-star “review” on his own book, an act that violated Damazon’s review policy…that was of no matter. Those rules didn’t apply to D. Preston, Esq. He IS Robin Hood, poaching in the king’s forest, robbing from the rich Beelzebezos, and giving to the Preston-Book-Deprived poor! Robin Hood: Robin Hood laughs in the face of all. Hah, hah, haaa. Robin Hood: Not as yet. The Doctor: Lucky I’m here, then, isn’t it? Preston wakes up and checks Amazon and is shocked! Shocked I tell you, that his books isn’t available. Waits until business hours to call his agent. Agent says he’ll look into it immediately. Agent gets a cup of coffee, reads his emails, chats up the PA, checks out Facebook, Twitter, looks for a cute cat picture. Finally he checks Amazon, and calls his contact at the publisher. Publisher says he’ll look into it immediately. Publisher gets a cup of coffee, reads his emails, chats up the PA, checks out Facebook, Twitter, looks for a cute cat picture. Finally he checks Amazon, and calls the IT guys. The IT guy says he’ll look into it immediately. Publisher gets a cup of coffee, reads his emails, chats up the PA, checks out Facebook, Twitter, checks out a bunch of technical forums. Gets into a long conversation with co-geeks on the shirts from the APAC conference vs various SCI TV show uniforms. Finally he checks Amazon, discovers the ebook really isn’t there. The IT guy then checks his logs, and other means of determining what’s happened to the book. Goes “Oh, S***” when he realises that they didn’t sent to book to Amazon. Sends the book to Amazon. Tells the Publisher guy that the book is at Amazon. The Publisher tells the agent that the book has been at Amazon for a while. The Agent calls Preston and tells him that the book has been at Amazon all this time. Preston writes review on Amazon.